"Norman, the Duke Khaki Squares also arrived. This pen is very nice. The nib is smooth and has nice ink wetness. This will become a favorite for my rotation of my other pens. Thank you for your fast and excellent customer service!" "Hey Norman, received my pens [also the Dragon Overlay] on Tuesday, thanks for the quick shipping. I absolutely love every one. I already own a Cross and a Lamy and these put them to shame. The weight and feel are excellent. The fact that they are metal and that they cap and post firmly was an awesome surprise. Thanks and we will talk again soon." 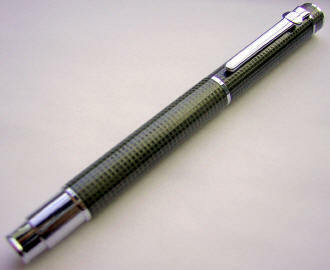 I struggled a bit in finding a name for this pen (DUKE tends to only number models, and this is #929), and actually spent quite a bit of time reviewing color charts to find one. I wanted to highlight the rather fetching appearance of this color and although I never found an exact match, the closest I came to was 'dark khaki'. 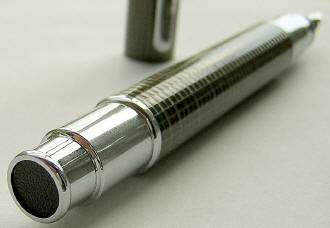 Matched with the sharply defined squares that cover the cap and most of the barrel, the moniker was born. 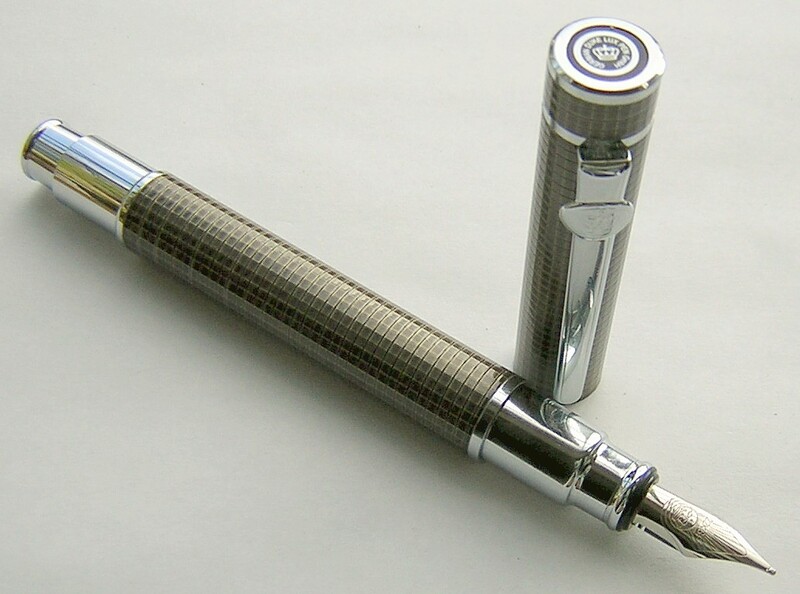 The pen is constructed of brass and chrome overall, but the lacquering that now gives the pen its name gives it a texture somewhat like that of snakeskin pens I've felt in the past. It's a full-sized pen, measuring 5-1/4" capped and 6" posted, and has a pleasing heft without being at all tiring during long writing sessions. It's well balanced, whether one writes with the cap posted or held aside. 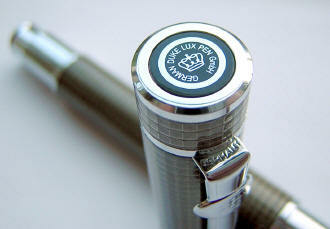 The cap top bears the DUKE 'crown' logo as well as company identification, and the crown is reprised on the clip itself. The cap snaps securely into place, on both ends of the barrel. 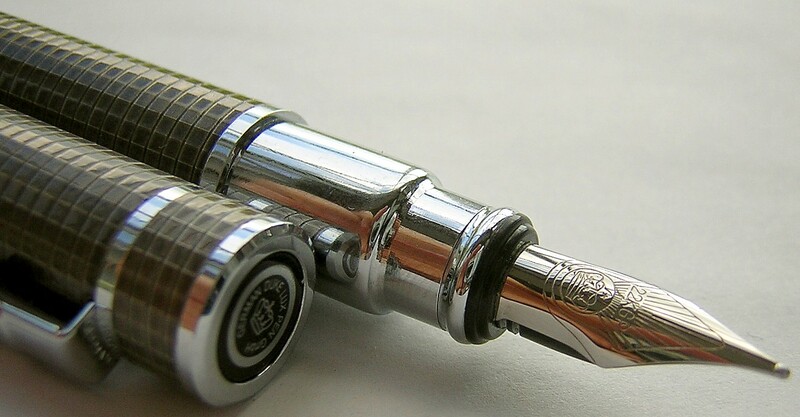 The barrel-end has a black, textured 'jewel', which serves no purpose other than to provide a nice design element, and somehow fits better than leaving it all chrome. 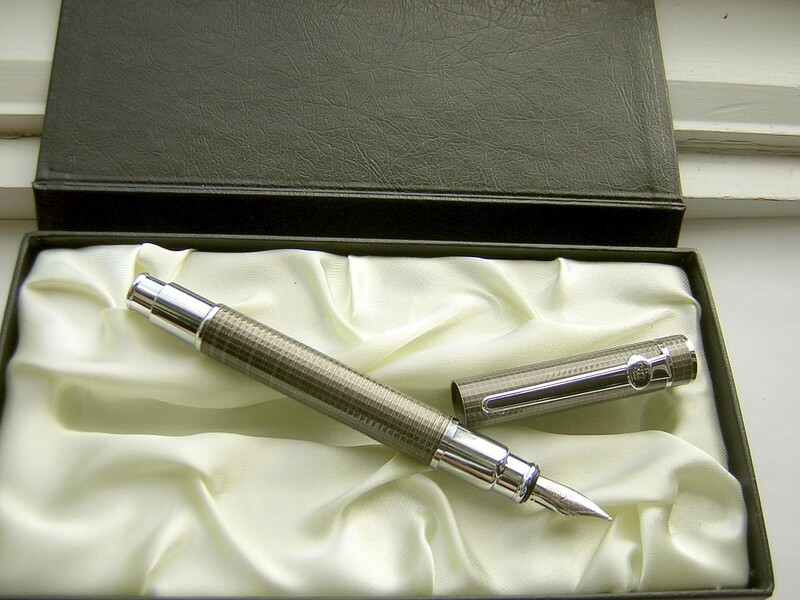 The steel nib, an indented spear shape, is finished with white 22K gold and attests to that fact within a modified scallop shell engraving. The DUKE crown logo is also reproduced here. The nib size, like virtually all DUKE models, is what I describe as a light-medium, falling in between a typical western fine and medium. Unscrewing the all-metal fittings between the section and barrel reveals a large capacity piston for bottled ink. The pen is comes in a sateen-lined gift box, which has a magnetic closure.